Happy Friday! 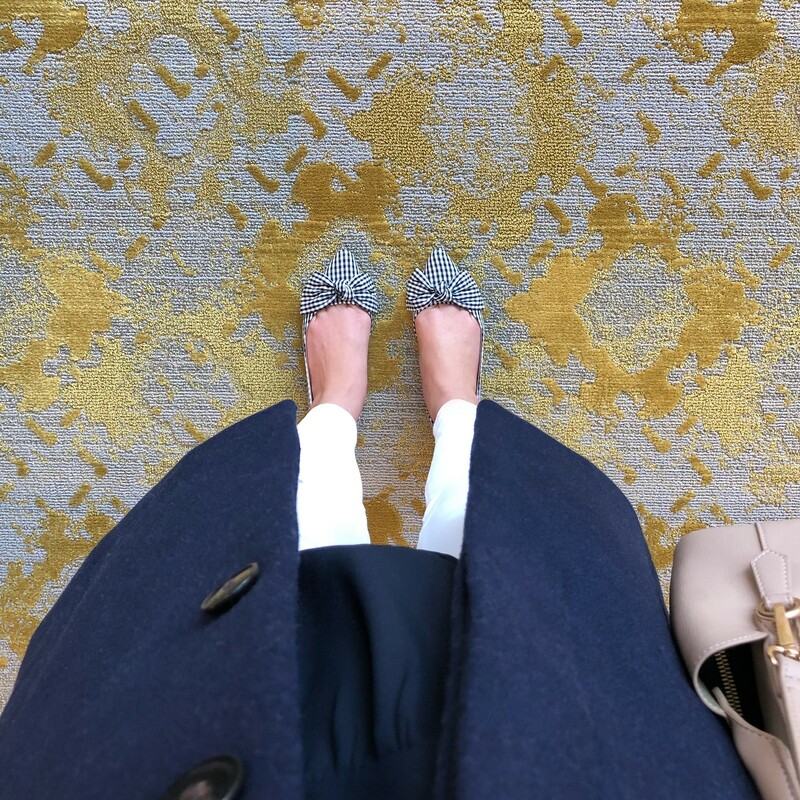 I finally wore these bow flats (review here) out yesterday when it felt like spring. The flats were very comfortable but then again I didn’t do much walking yesterday since I sit and stare at my computer for most of the day at work. The weather has been all over the place lately and it’s really windy and rainy today. Last weekend my poor gingham print umbrella died when the heavy winds bent two of the spokes beyond repair so I guess it was a good thing I got a backup of the same umbrella. 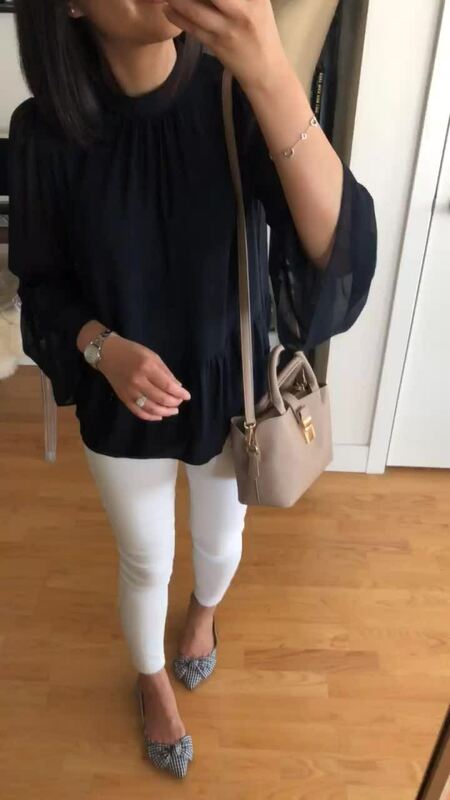 This navy peplum top (review of the white color here) is so gorgeous. I took size XXSP which fits like size XSP. FYI. I received a few new tops in the mail that I’ll review when the lighting gets better. It’s currently too gloomy to get good pictures or videos. I got this $22.90 taupe bag last weekend in an attempt to finally use my Forever 21 store credits. The taupe color is sold out online but you may be able to find it in stores. It’s well made but the outer flaps are a bit flimsy as another online reviewer noted since the material is thinner and it’s more noticeable if you try to cram too much in the bag. The bag looks its best when it’s not overstuffed. It’s a decent bag for the price if you don’t need to carry around a lot of things and I like the classic shape. There’s a zipper compartment in the middle to keep your credit cards safe. You can catch my review of this bag in my Instagram highlights @whatjesswore under the ‘Currently Coveting’ section. 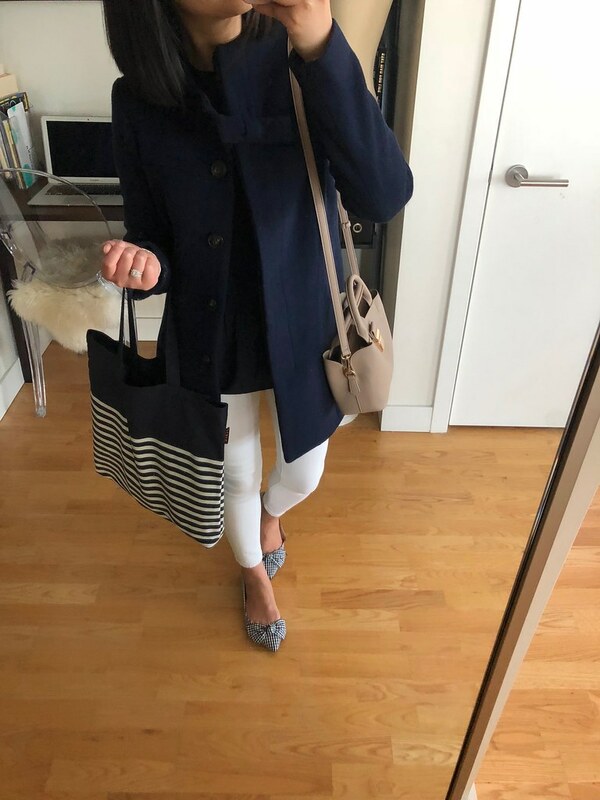 I know I look like a bag lady here but I’ve been using this reusable tote as an extra bag for work on days I carry a small purse. I have my work laptop and some paperwork inside. 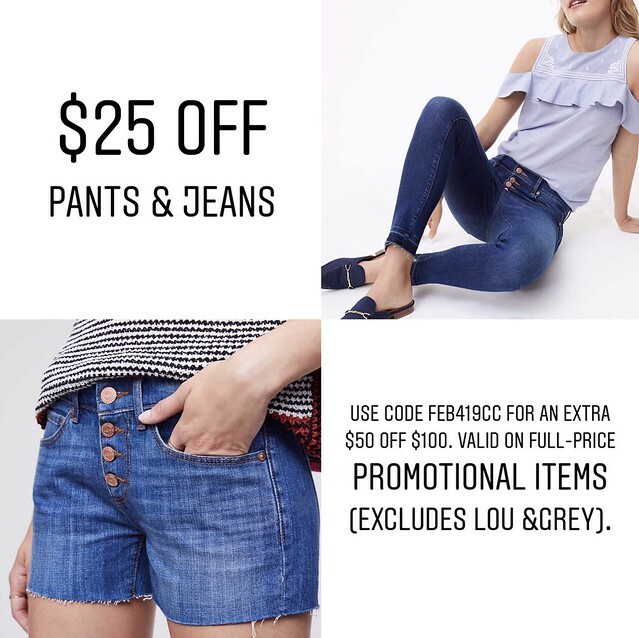 Get $25 off pants and jeans and since no code is needed you can use code FEB419CC for an extra $50 off $100+ as mentioned in this post. It’s valid on full price items and full-price items on promotion such as pants and jeans. I’m surprised to see that the code is still working now that it’s March. The code will not work if you have an item from the ‘sale‘ section in your cart as sale items will not qualify towards the $100 minimum in order to apply the $50 discount. You can also use this tip to get FREE shipping on orders of $50+ (old post so please ignore the sale alert in the post). LOVELOFT cardmembers get an extra $15 off your entire purchase in-stores or online when you use your LOVELOFT card and code LOFT15. Excludes full-price Lou & Grey. Valid 2/14/18-3/31/18. You can save this offer to your mobile wallet by texting LOFT15 to 28162. Read the fine print here. Despite the fine print I noticed that this code only works online if the shopping cart is at least $50+. The code works on both full-price styles and sale styles which are currently 50% off. You will see the savings applied when you ‘review order’ and before you ‘place order’. Note: The shopping cart only accepts one code at checkout. The extra $50 discount is divided between the items you order and if you happen to return an item that doesn’t work out you will not lose out on the discount. 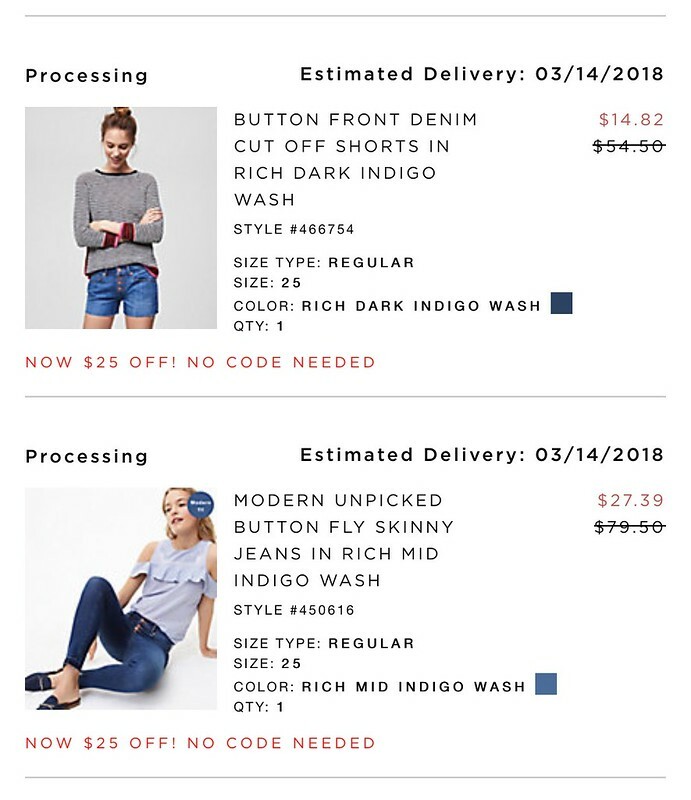 For example, if I return the button fly jeans (review here) then I would get back $27.39 but the button front shorts would remain at the price I paid ($14.82). Note: Not shown in the above screenshot but I added a pair of $16.50 tights in order to get the total just over $100 and the tights came down to $8.29 after the discount. 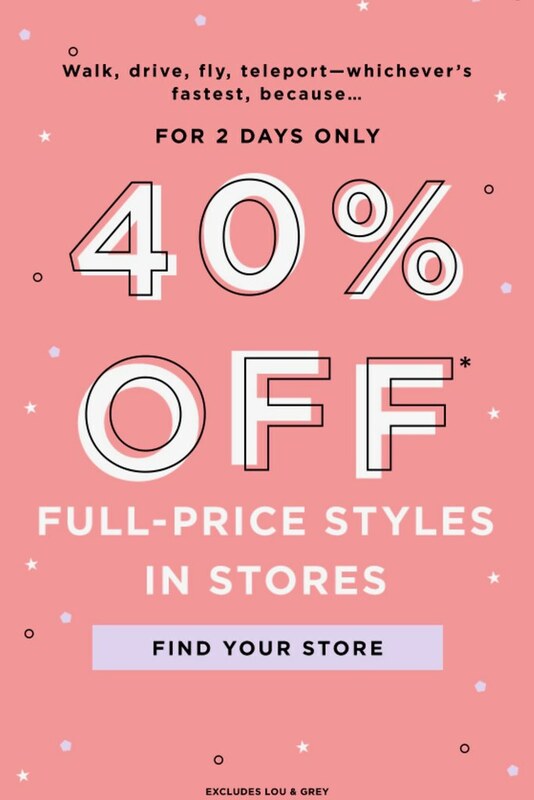 Get 40% off full-price styles at LOFT (in stores only). Excludes Lou & Grey. Usually when LOFT does these in store only promotions they change the sale to include online orders on Sunday night. Let’s see what happens. Just a friendly reminder that you can receive $50 LOFT Cash for every $50 you spend in stores and online. If you don’t receive your LOFT cash with your online orders just call customer service so they can check and mail you your missing LOFT cash or put it on record if you call in to place an order over the phone. Refer to this old post if you need more clarification on how LOFT cash works.